I seem to be looking at a lot of art made from other stuff at the moment. The journey from Bruce Lacey’s assemblages and robots at Camden Arts Centre to Damián Ortega’s sculptures at White Cube Mason’s Yard is a short tube ride and a big conceptual leap. Both exhibitions include sculpture made from ordinary objects but the two shows feel worlds apart. 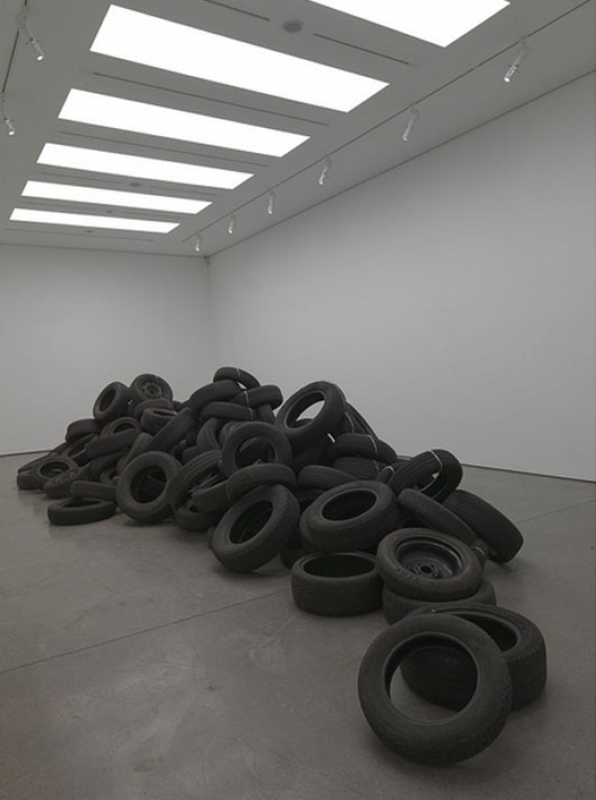 In the upstairs gallery, a long unruly pile of tires runs almost the length of the gallery. Running over it is a straight line of white, perfectly drawn in salt. The line goes up and down as it crosses the ridge of tyres but if you look down on it, it remains straight. The press release talks about salt as both a preservative and a commodity but also suggests a possible alternative reading as a line of cocaine. 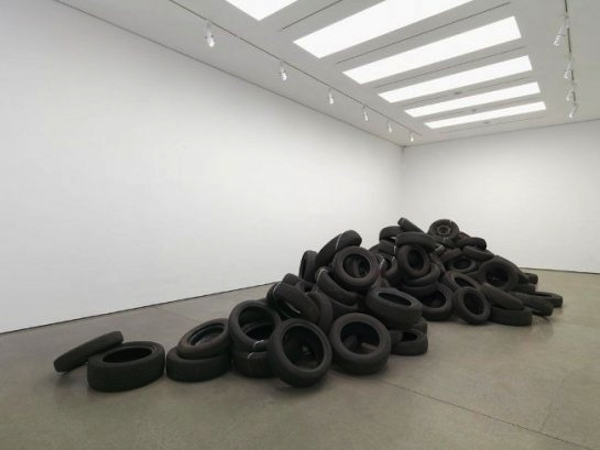 Given the title of the piece – Congo River – and the way the white line traverses the tyres, the idea of a journey seems clear. The press release talks about the river journeys in Heart of Darkness and Apocalypse Now, both of which, it says ‘use a journey along a river as a mythical and symbolic setting to examine notions of colonial repatriation, fear of the unknown and the ‘other’.’ None of which, if I’m honest, I would have got from the work. Nonetheless, for me the perfect line drawn in a wilful material on difficult terrain seems a powerful enough symbol without the references to literature and film. The tyres also suggest a broken landscape to me, in part because of the form they take, which is a kind of mountain range, but it’s also to do with the strength of the smell of rubber. And of course, abandoned tyres are generally found in more run down areas, which perhaps does bring me round to the idea of trade routes and exploitation. In the smaller lobby space downstairs lies a bicycle with salt underneath it. It looks as though the salt has been poured over the bicycle, so that there’s a perfect negative space drawing of it in the salt on the floor. A light flashes from above from time to time aligning the shadow with the drawing. 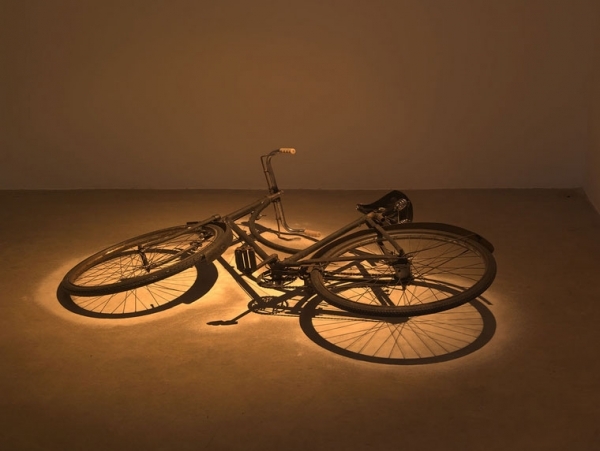 Here the salt is literally preserving the image of the bicycle, though of course it could also aid the process of decay. From across the room this piece is watched by a series of cameras – from a Rolleiflex twin lens reflex medium format camera to an iPhone – cast in concrete. 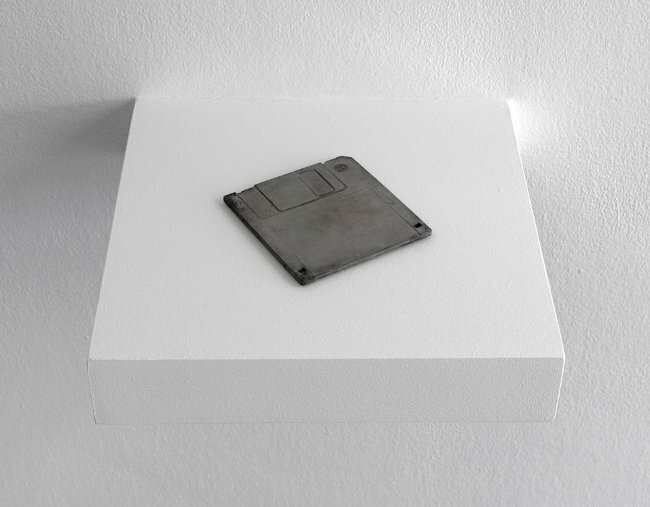 Like Stone, a concrete cast of a diskette in the lobby upstairs, Fossilised is technology held in the moment: preserved for posterity but now useless. 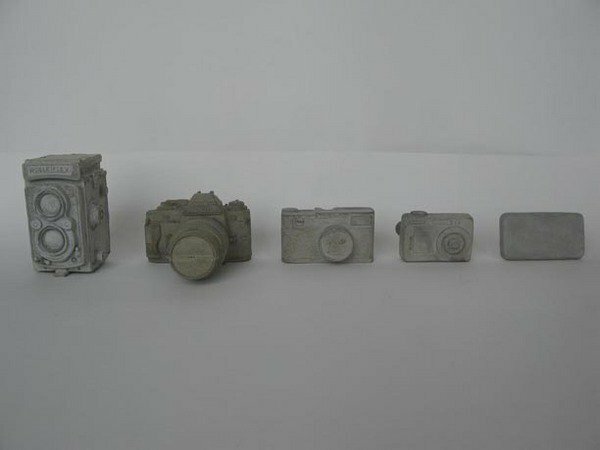 Seen in the context of Preserved, the cameras reiterate the notion of the photographic present in that work in the form of the flash. As is often the case at White Cube Mason’s Yard, the most enagaging work is saved for the main gallery downstairs. It’s here we find Hollow/stuffed, market law, a submarine – apparently based on a plastic toy of a World War II submarine – made from plastic sacking used to transport sugar, and other foodstuffs. The room is dark but for the lights trained on the sculpture, so it seems to glow slightly and casts shadows around the space. The submarine looms but its menace is reduced by the realisation that it’s not a solid object; indeed at the front a steady stream of salt pours out into a pile on the floor. The pile – rather larger now than it was when the photograph above was taken – is an ever growing conical mound with suggestions of time passing and of course of the imperfection of the structure from which it is pouring. Again the press release offers a reading I wouldn’t necessarily have reached without it but which offers an interesting perspective; submarines are now used as a means of trafficking cocaine from South America into Mexico, Ortega’s country of origin. Quite apart from the fact that I like Ortega’s work this is an exhibition that’s given me a surprising amount to think about in terms of trade and commerce, identity, the impact of the drug trade and ideas around photography, memory and technology (connecting with ideas that are milling about in my head at the moment anyway). Not bad for a show that includes only five works. 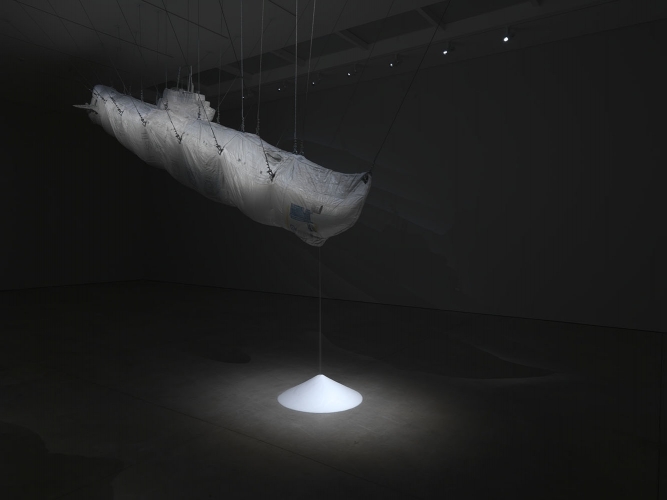 To bring this post back to where I came in: The Bruce Lacey Experience made me laugh – it’s a hugely enjoyable, life-affirming exhibition – Damián Ortega’s Traces of Gravity has given me more to think about. And ultimately I think Ortega’s is an approach and an aesthetic that interests me more. This entry was posted in Assemblage, Installation, Sculpture and tagged art, assemblage, Congo River, Damian Ortega, Fossilised, Hollow/stuffed; market law, Preserved, readymade, sculpture, Stone by Ann Jones. Bookmark the permalink. It’s great when press releases offer another avenue, but don’t eclipse, or lock down other meanings. Nice to “see” this work through your eyes. Yeah, I’m often resistant to actually reading labels and press releases (in part because they so often do close down other readings) but with work like Ortega’s it makes a difference to understand the context better. But it’s especially pleasing that there’s so much to see in the work even without that.